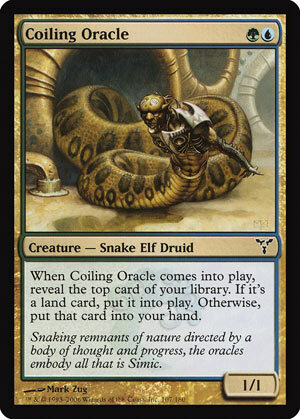 Back in 2006, Coiling Oracle was actually a rather common sight in competitive constructed. It certainly doesn’t look impressive just by the numbers; really, it’s always been about that comes-into-play ability. An extra card can dig you towards the midgame when you hit the Oracle early in the game; an extra land can do so even faster, especially when the land is something like Simic Growth Chamber. The fact that something always happens regardless of what card he reveals also ensures that he remains relevant after the early stages of a game. To be fair, almost any creature is reasonably playable when Umezawa’s Jitte is in the format – I’ll never understand how that card didn’t get banned in Standard. But the applications of Coiling Oracle in staple Simic strategies in casual and competitive settings ensures that he will never be “just” associated with broken Equipment seasons. Coiling Oracle is a two-mana cantrip creature that can help accelerate your lands. To be fair, Coiling Oracle isn’t the flashiest creature, but never underestimate the value of cantrips. A 1/1 isn’t great, but a ~33% chance it accelerates you into another land is a very good thing. And even if it whiffs there, you still get to draw a card. The small body did play decently with graft back in Dissension, and being an Elf is pretty fun overall. There are plenty of ways to abuse this little friend, and it is a reasonable turn 2 play even if you play it fairly.